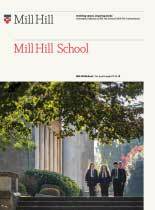 Mill Hill School is dedicated to the education of its students but also to enriching their lives as a whole. The below time table shows the variety of talks the school holds in relation to pupils lives. The Enrichment Lecture Series – Lower Sixth Pupils. MacroAdventure – A nine month expedition from Alaska to Argentina exploring business as a force for good.